What Should I Do if a Company Truck Driver Hit My Car? If your car was hit by a company truck, it is important to know that your accident is different than an accident where two cars hit each other. Trucking companies are often aggressive in defending their employees and there are often multiple insurance companies involved in settlement discussions. These cases are complex. Our lawyers understand this and have successfully represented clients in cases against truck drivers and trucking companies. You can contact our lawyers to file a personal injury or wrongful death lawsuit. We pursue these cases aggressively and seek fair and full compensation for our clients. Our client was a 26 year-old female passenger whose right leg was traumatically amputated when the motorcycle on which she was a passenger was struck by a drunk driver. Our client suffered severe neurologic injuries as a result of Listeria monocytogenes, a food-borne pathogen. The present value of our client’s recovery is $3,400,000 and the sum of current and guaranteed future payments is $6,413,333. One of the largest Listeria food poisoning settlements in U.S. history for a young man who contracted meningitis from a contaminated food product. 1. Report Your Truck Accident to Your Insurance Company. You need to report the accident to your insurance company. When you do, do not tell them how you feel or provide any information other then what is in the accident report. If your insurance company asks you a question that makes you uncomfortable, tell them your attorney will talk with them, and give us a call. Do not sign anything without contacting our truck accident lawyers first. You will most likely be contacted by insurance companies regarding the accident. Do not speak to them. Do not sign anything! If you have not retained a lawyer, tell the insurance representative that you are retaining a lawyer and that the lawyer will contact them. If you have retained a lawyer, give the insurance company representative the phone number of the law firm and no other information. Most people do not realize that even a friendly conversation with an insurance representative can be used against them. For example, most representatives will express concern and ask how you are and/or how your child is if the child was involved in the accident. Do not answer them. Give them our phone number (1-888-377-8900) and say nothing else. Remember that insurance representatives are trained to get information from you that the insurance company can use in its favor. You may also be contacted by the company’s claims adjuster, who began to protect the trucking company’s interests right after your accident. The designated investigator collects evidence to defend or minimize the claim. The trucking company adjuster may attempt to steer you away from hiring a truck accident attorney, because they know that if you have an attorney, you are more likely to receive a larger settlement. We highly recommend that you do not discuss your trucking accident with the trucking adjuster or anyone unless you have attorney representation, as anything you say may be used against you later. If you are contacted by the trucking company’s adjuster, provide the phone number of your truck accident attorney, if you have retained one. If you have not retained an attorney, tell the adjuster you are planning on hiring one, ask for the adjuster’s phone number and tell the adjuster that you will have your attorney call. As with insurance representatives, most adjusters will express concern and ask how you are and/or how your child is if a child was involved in the accident. Do not answer them. Photographs of the accident are evidence. Take photographs of your vehicle before any repairs are done on it or before it is destroyed. If you retain our law firm, we will attempt to locate your vehicle and take additional pictures if necessary. If you are able, take photos of the truck and as much of the accident scene as possible, including any debris. You should also take pictures of your injuries. If your loved one is the person injured in the accident, it can be difficult to take these pictures. We will hire a photographer to take the pictures if you prefer. When the victim is a child, parents are often uncomfortable having any pictures taken, particularly by a photographer. We understand. It may be helpful to discuss this and other issues with attorney Fred Pritzker, our senior partner with over 30 years of experience. If you have contact information from witnesses and/or license plate numbers of the cab and trailer and other vehicles involved in the crash, that information should be forwarded to your lawyer. If you retain a lawyer at our firm we can do that for you. In some states, you must report an accident to the department of motor vehicles if the truck accident caused a death, injury or more than property damage over a certain amount. Make sure that your vehicle and the truck are inspected and photographed before any repairs are made. Our law firm has information about the best medical professionals for truck accident injuries throughout the country. Contact us if you would like us to help you in this area. For our clients, we monitor their injuries and make sure they get the best medical specialists. Throughout the recovery process, we use cutting-edge technology to document your injuries and how they affect every aspect of your life. Because truck accident cases are complex and multiple insurance companies may be involved, you will need to retain a lawyer to represent you. This should be done as soon after the accident as possible. If you retain one of our attorneys, we will immediately begin investigating the accident, gathering and preserving evidence and taking all measures necessary to preserve your legal rights and obtain compensation for you. Companies with their own fleet of trucks include FedEx, UPS, Walmart, and many others. These corporate giants have teams of lawyers, and you need someone fighting for your legal right to compensation. Attorneys Fred Pritzker and Eric Hageman Inspect a semitrailer after a crash. Our lawyers have won multi-million dollar settlements and verdicts in lawsuits against trucking companies, including a recent $5.1 million settlement for one client. 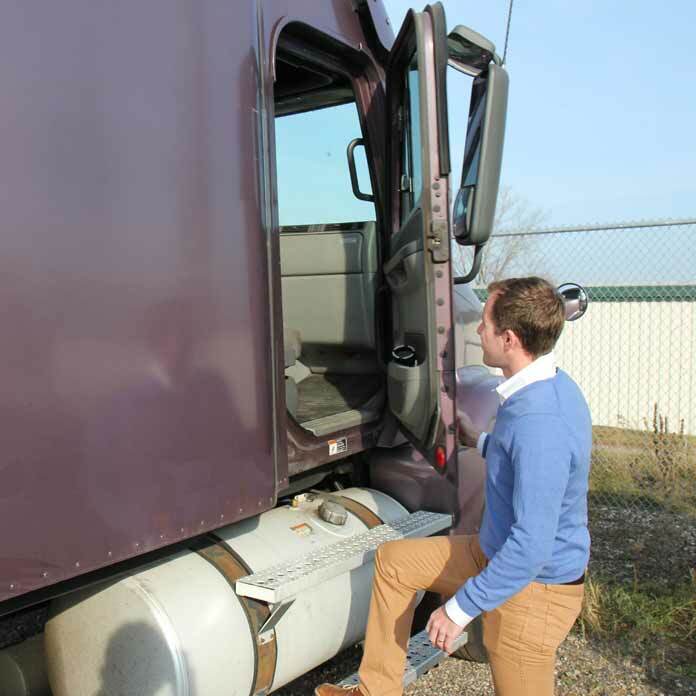 Brendan Flaherty, an accident lawyer at our law firm, inspects a truck that has been in an accident. For more information, see our truck accident FAQ.